Located on the Gulf of Mexico and behind the gates of the Longboat Key Club, residents enjoy spectacular views of wonderful sunsets. 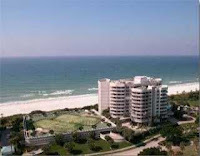 Condos at Beaches offer fabulous features with views of the Gulf, golf course and tropical gardens. Amenities include: beachside heated pool/spa, fitness and party rooms, garage parking/extra storage and 24 hr concierge. Beach was recently remolded and has an on-site manager. Prices start at $639,000. There are currently five units available in the Sarasota MLS.